The posterior cruciate ligament, or PCL, is the strongest ligament in the knee. The PCL is the stronger cousin to the ACL which most people have heard of. 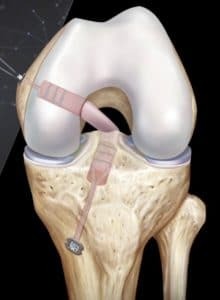 While the anterior cruciate ligament, or ACL is injured more often than the PCL and is more well known, PCL tears account for nearly 20% of knee ligament injuries. 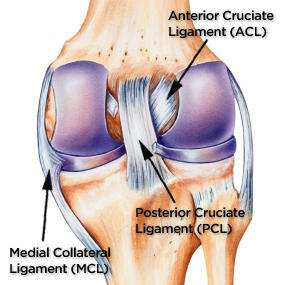 The ACL sits in front of the PCL location in the knee. It is not uncommon for a torn PCL to be missed on examination and left undiagnosed. Many people will present to our office many months after their injury as a third or fourth opinion. The posterior cruciate ligament functions to prevent the tibia from moving backwards when the knee is bent fully. Therefore, patients with a PCL injury often complain of problems with deceleration, problems going down stairs, or twisting, turning and pivoting activities. Because the PCL is so powerful it generally takes a big blow or injury to tear it. Common ways to injure the PCL include car accidents where your knee hits the dashboard, and football players falling onto a bent knee. PCL injuries are classified according to how much of the ligament has been torn. Grade 1 PCL Sprain: partial PCL tear. These knees are not very loose. Grade 2 PCL Tear: Usually more than 50% of the ligament is torn. Grade 3 PCL Tear: Represent a complete tear of the PCL. Most people with PCL injuries do not notice as much swelling or pain as a person with an ACL injury. That’s because the PCL is in the back of the knee joint and depending on where the ligament tore, it may not cause bleeding into the knee. When someone tears their ACL they are rarely able to walk on it. When someone tears their PCL, they may complain of pain, but they are often able to walk off the field after injury. Both the femur (thigh bone) and the tibia (shin bone) connect at the knee joint. They are held together by many ligaments. The posterior cruciate ligament (PCL) is located in the back of the knee. The PCL is by far and away the largest and strongest of the ligaments that hold the knee together. 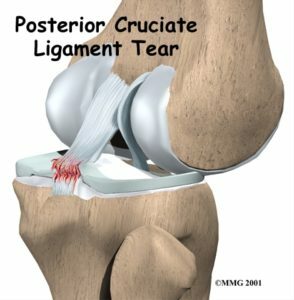 As I mentioned before it is not unusual for people to believe they had a simply strain or sprain because they often do not have much pain after a PCL tear. Many people with PCL injuries do not seek immediate medical attention. Most PCL tears occur due to high energy injuries. These include car accidents, and striking your bent knee hard against the ground. Hyperextension of the knee, where the knee bends backwards is also a fairly common mechanism of injury. Because it takes so much force or energy to injure the PCL it is not uncommon to injure other ligaments in the knee at the same time. Common associated ligament injuries include the ACL, the lateral collateral ligament and a complex area we call the posterolateral corner of the knee. Your symptoms after a PCL tear will depend on the severity of your injury. Grade 1 sprains will cause some discomfort or pain in the back of the knee. A grade 1 PCL sprain will not cause a feeling of instability or giving way. A Grade 2 injury is a partial tear of the PCL. The PCL will be loose, but in general it will not be loose enough to cause instability. If a grade 2 injury causes a feeling of instability it is usually because you have injured more than one ligament. Grade 3 PCL injuries usually occur in conjunction with injuries to other ligaments. The most common associated injuries include the lateral collateral ligament and the posterolateral corner. After a grade 3 injury the knee will feel wobbly or loose. Most people will notice difficulty going downstairs and downhill. If the lateral side of the knee is involved then you will notice the knee wants to give out to the side too. Grade 3 PCL injury with lateral involvement generally create very unstable knees. For an experienced knee surgeon, diagnosing a PCL injury is not difficult. When you are lying down we will bend your knee to 90 degree and push your shin backwards. The tibia or shin will sag backwards if the PCL is injured. The most important part of the physical examination for a PCL injury is to determine if anything else is torn. The treatment of a PCL injury will be determined by its grade and whether or not it is an isolated injury. If other ligaments are torn then these injuries will generally heal better if surgery is performed sooner rather than later. If you have injuries to both the PCL and the lateral side of the knee we will also be concerned about the status of your blood vessels and a nerve on the outside of the leg. With severe PCL injuries the knee might have dislocated. That can cause a disruption of the blood flow to the leg or it can injure the peroneal nerve which can affect your ability to move the ankle up and down. After your first visit we will usually order an MRI to assess the integrity of the cartilage and other structures in the knee. Once the entire clinical picture is clear we can then plan your treatment. Many PCL injuries can be treated without the need for surgery. All isolated grade 1 and grade 2 PCL injuries can be managed with physical therapy. Most athletes with a grade 1 or 2 PCL injury will be able to return to sports within a few weeks to months. The treatment of grade 3 injuries which cause instability or giving way is surgical. During PCL surgery we will reconstruct or rebuild a new PCL ligament. During the surgery we will make two or three small tunnels in the bone. After the tunnels are created we will place the new ligament into the tunnels and attach the ligament with screws. During your examination in the office we determined if there were other injuries as well. If we determined that there were injuries to other ligaments in the knee then we will repair or reconstruct those at the same time. If we find meniscus tears within the knee those will also be repaired. The most common associated ligament injury is the LCL or the lateral collateral ligament and the posterolateral corner. If your injury is recent then we will often be able to repair these structures. If the injury is old or chronic, then we will need to perform a LCL and posterolateral corner reconstruction. This might seem extreme… but if we do not fix all the torn ligaments that have not healed then it will increase the risk that the PCL surgery will fail. Therefore, if you have a multi-ligament knee injury, you will require that all the ligaments be repaired at the same time. That is the most reliable way to give you the best way of returning to an active lifestyle. The recovery from a mild PCL injury will be far more rapid than the recovery from a PCL injury requiring surgery. A patient with a PCL sprain will be able to return to sports within a few weeks or months. After PCL surgery we need to wait until the knee ligaments heal. We also need to rehabilitate the knee so that your leg is strong and ready to return to sports. Many athletes will require 8-10 months to return to sports after an isolated PCL reconstruction. If an athlete requires repair of the PCL and the posterolateral corner then it will usually require rehabilitation for 10-14 months before returning to sports. Why Can't I Straighten My Knee? Why Does My Knee Swell ? 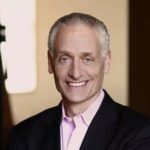 ← Why didn’t my rotator cuff heal ? What a comprehensive explanation for a pcl tear. Thank you.